and extended family for Thanksgiving. with leftover turkey to share. of siblings, nieces and nephews, their spouses, and my mom …. I am also very THANKFUL TO bHOME. in the center of the table. The Magnolia garland is from Balsam Hill. 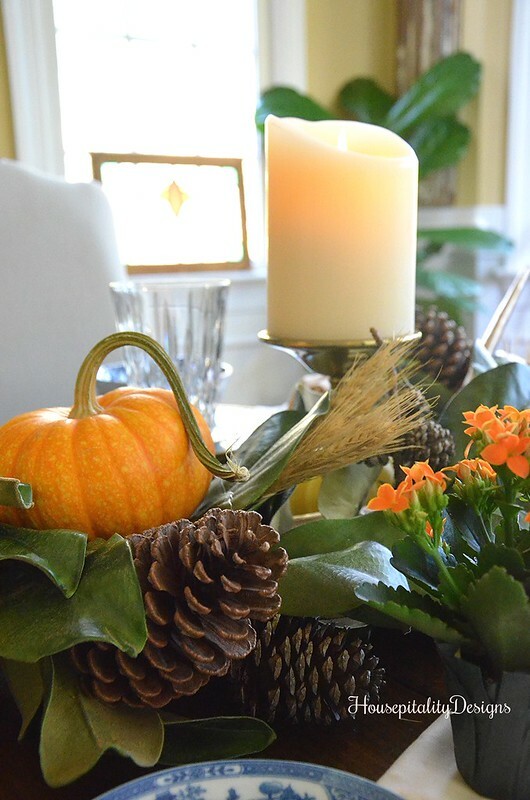 After Thanksgiving, the garland will grow legs and will walk to another place in the house. 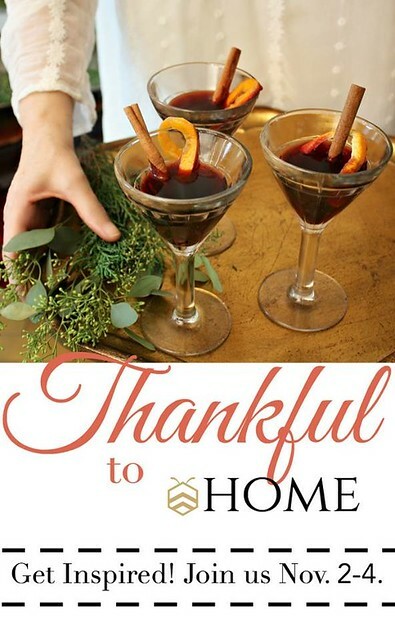 Today, is Day 2 of the bHome “Thankful to bHome” Blog Tour. I am joining 4 other bHome bloggers and friends today. You can see the links of today’s participants and also the participants of Day One below. They are not to miss!! There is also a great giveaway with details at the bottom of the post. as it provides for a wonderful base to work with. wonderful flickering Miracle Flame Candles, also from Balsam Hill. I am thankful for the blessings of family. 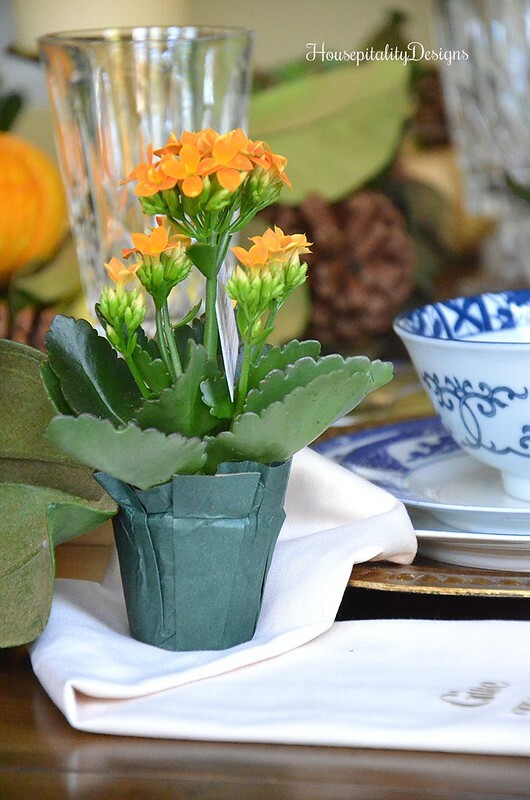 I tucked the place card into a tiny orange Kalanchoe plant. Love using things such as a plant for a parting gift. I was happy to get these sweet tiny orange Kalanchoes at Trader Joe’s. The perfect punch of color for the table. with the antique blue and white Noritake dishes that I got from my friend Martha. We miss Martha! I found this beautiful blue and white bowl on the place setting at TJ Maxx along with 3 others. to see who made it ….. I was pleasantly surprised it was from a company in Yokohama, Japan. I tend to do some “out of the box” things on my table. Like placing the silverware on a plate. The table is set that will be waiting for us when we return. 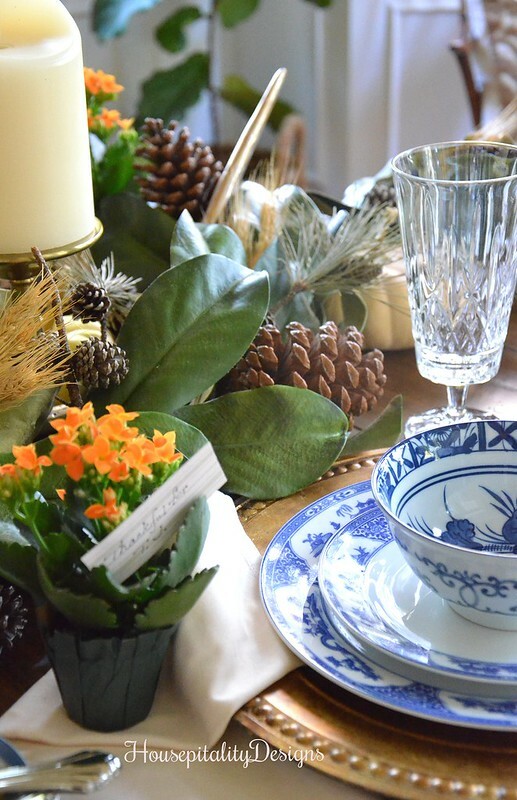 dress the table for Christmas! by this very sentimental Grandma! 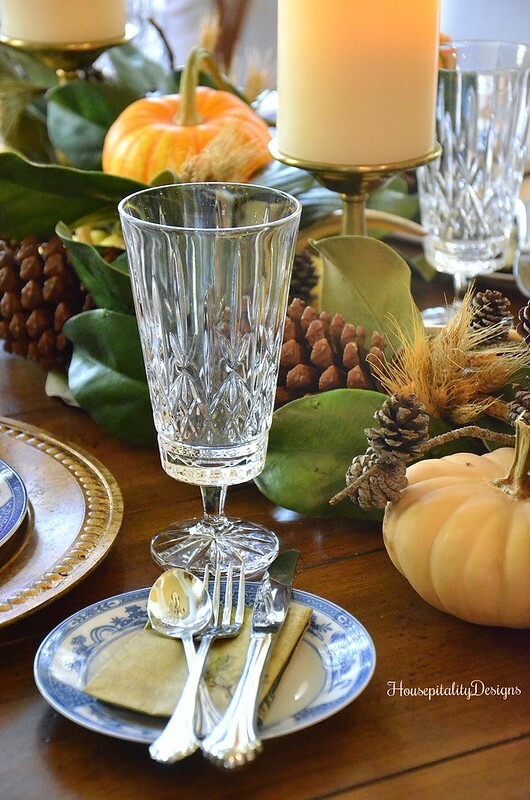 Hope you enjoyed my Post Thanksgiving Tablescape. 4 other bHome bloggers have for you today. The links will be below … and if you missed Day One, they are listed below too!! But first, let’s talk about the Amazing Giveaway! See the image below to see the wonderful items of the Giveaway worth $350.00. and come back here and let me know what beautiful item in Lidy’s gorgeous collection that you love! That simple! … Good Luck!! I wish you all a most beautiful day! Pretty table and I love the tiny plants. It’s so sweet that you pull out your granddaughter’s little turkey. I’m sure that brings a smile to her face each year. 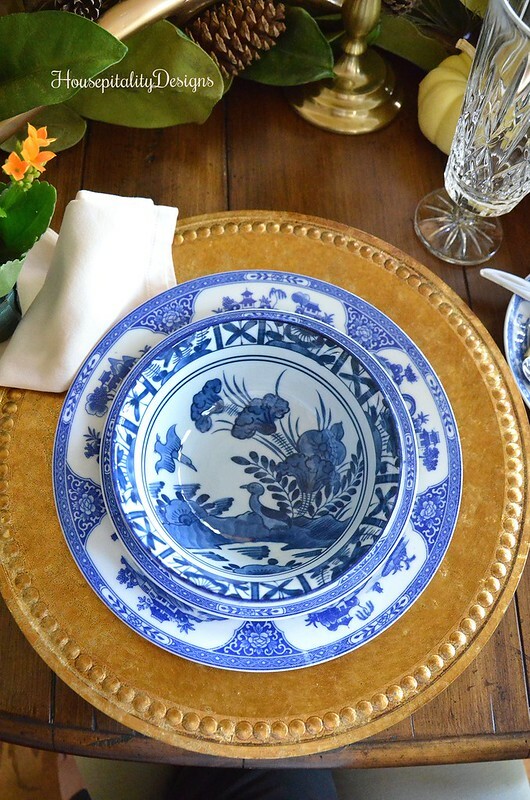 Shirley, what a beautiful table…blue and white is so classic! 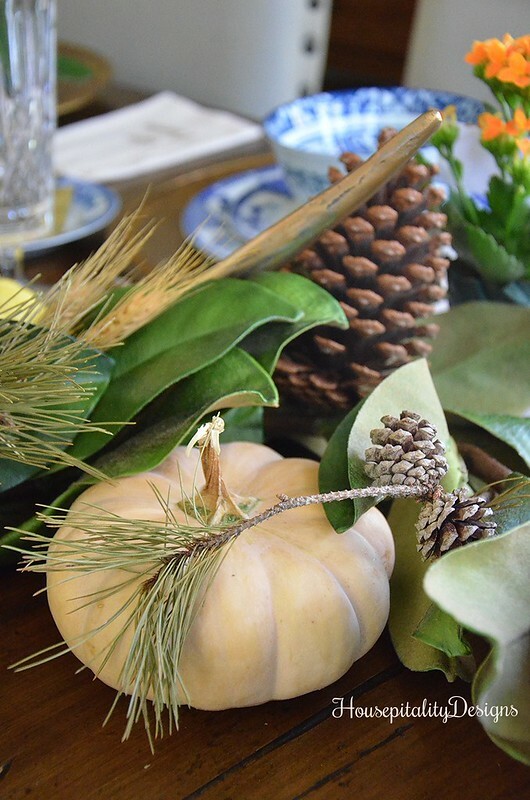 Magnolia is a favorite of mine to use on the table and the faux garland is perfect. But the most precious is your Sweetie’s turkey! Pam Richardson’s recent post…Mixin’ It Up! You are so right Pam!….the most precious!! 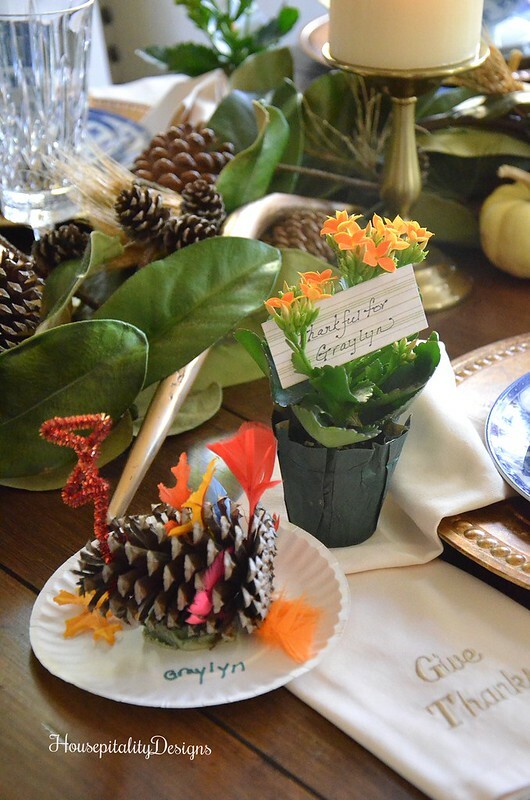 Your table setting is stunning, Shirley! I love how you’ve used special beauties that conjure up meaningful memories. What a treat and delight for your family to sit around your table this Thanksgiving! 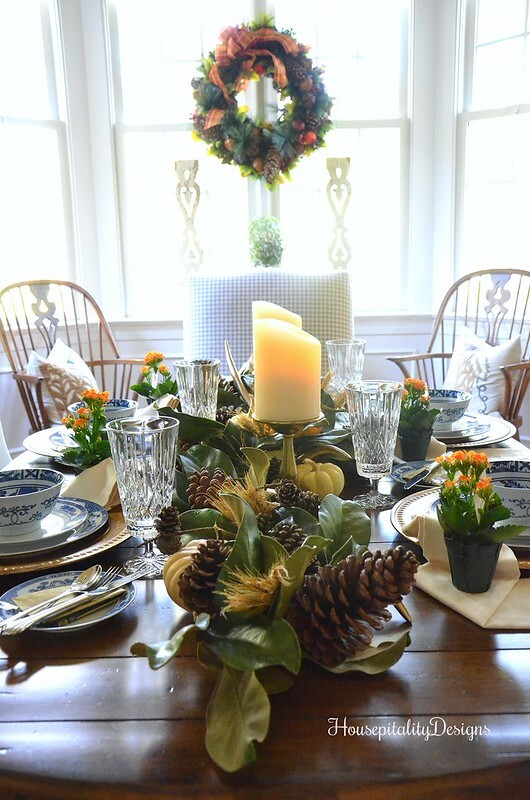 Shirely, i love how you incorporated the magnolia garland with pinecones into your thanksgiving table. Everything is set so beautifully except for one thing….I did’nt see my placecard at the table! I loved the garland you used and small plant from Trader Joe’s to send home with your guests, what a neat idea! Thank you for introducing me to the new site ‘French Garden House’, I could get lost at that site so many wonderful finds to imagine using in our home. I loved the necklaces and the french wicker garden wagon. Great idea to preset the table and cross that off to do list! Thank you! Such a pretty table! 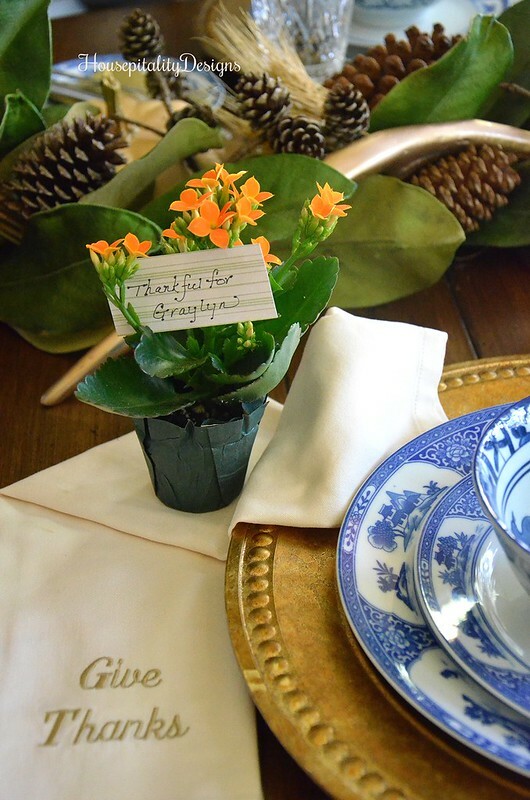 I like the idea of place cards in the small plants. I’ve noticed before that you don’t have a rug under your table. I’ve thought of removing mine so it would be easier to move chairs. Also it seems I’m seeing more blue with accents of orange this year – I really like it. Enjoy your day! 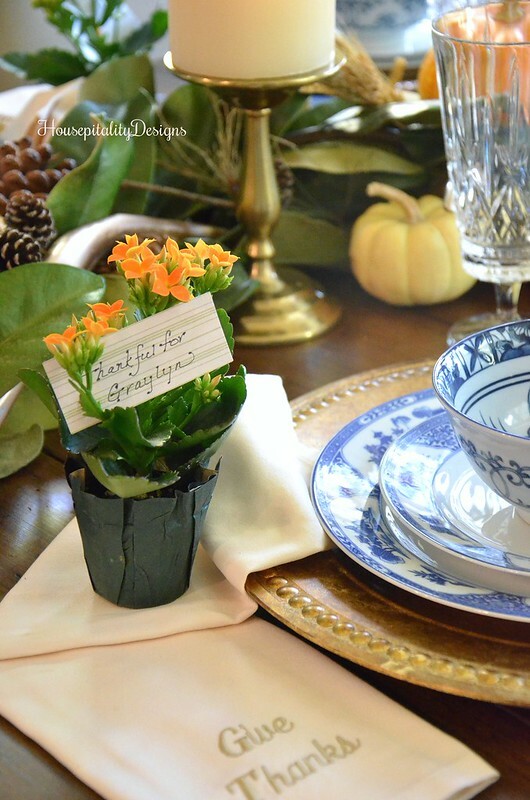 Penny at Enjoying The Simple Things’s recent post…Happy November (and some downsizing)! Love it, Shirley! And I think it’s AWESOME that Graylyn’s turkey is on your table:D She’s so darn cute! How’s your son doing in the new house? And how’s your decorating going over there??? Anxious to see it! 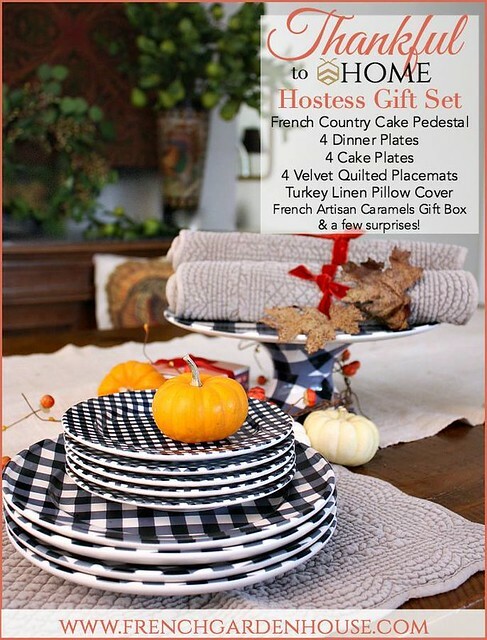 I love the black and white checked desert set and cake plate. I have a lot of fun black accents in my home and colorful art and accessories to liven up my home. I also live in Indianapolis, Indiana and host an Indy 500 race party every year in which I incorporate black and white checked decorations. 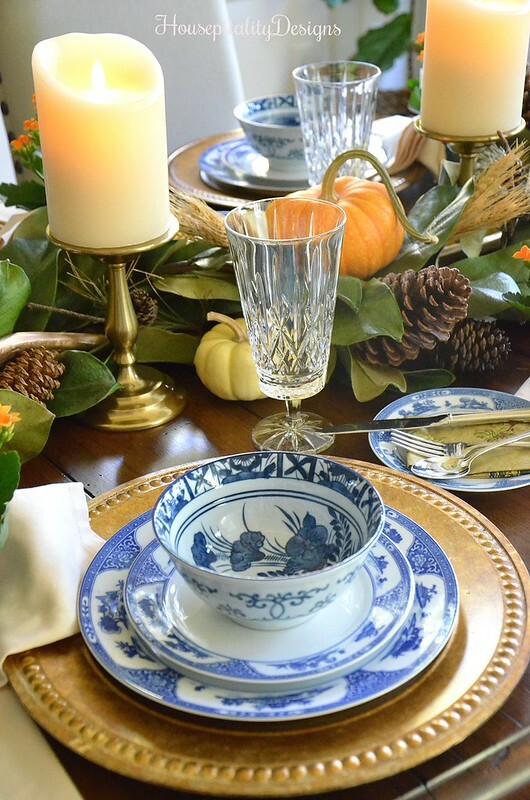 I also love your beautiful blue and white Thanksgiving table. Oh your table is beautiful! Love the little plants as bought one too! Your dishes are so pretty, love the little bowls! And the monogrammed napkins are gorgeous! I went to the site and LOOOOVE the red tartan flatware!!!! Oh how I would love to have a set of that!!! Have a beautiful day. We could get up to 80!!!! CRAZY! Pinky’s recent post…Sparkle on the Coffee Table! 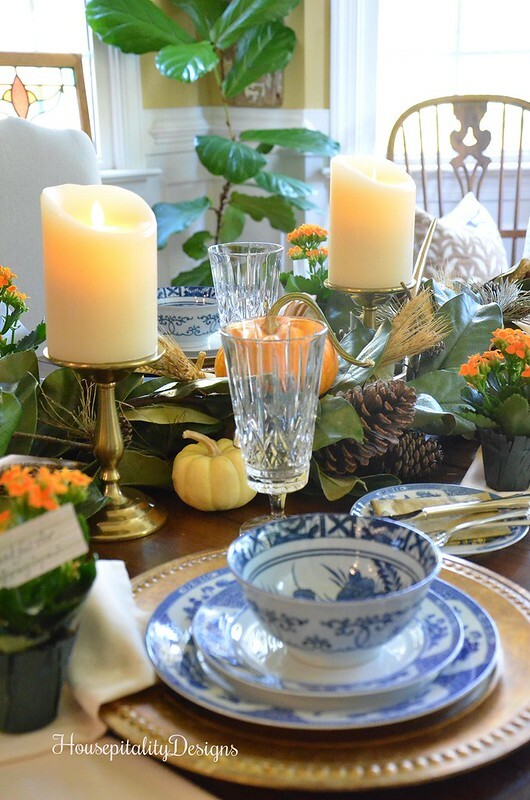 Lidy@FrenchGardenHouse’s recent post…Thanksgiving Entertaining Blog Tour DAY 2 & FGH Give-Away! The garden section has so many items I would love to own, especially the Antique French Watering Can. Beautiful! Shirley, your table is absolutely gorgeous! 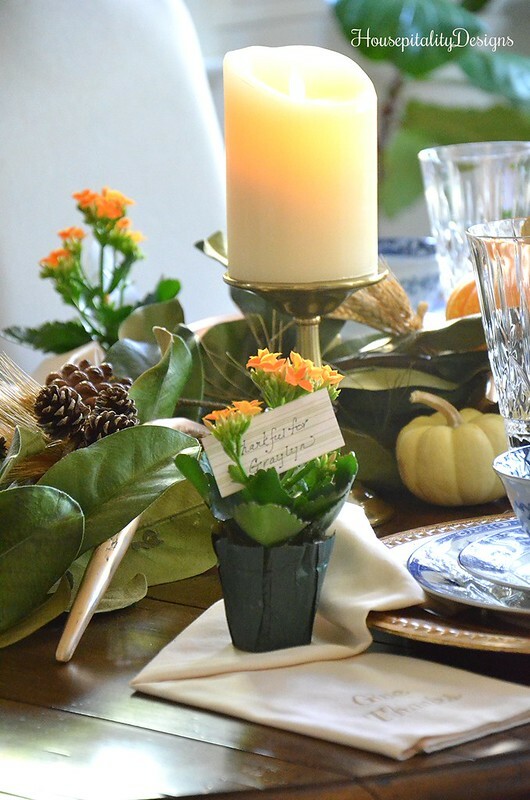 I love using magnolia leaves…so pretty with all the touches of Fall, and it will be perfect at Christmas too! What a precious turkey your granddaughter made. I know that you treasure it. I hope that you have a happy and blessed day!!! Gotta love that country soup tureen! I love the kitchen scale. Loving that French Green enamel ware coffee pot. Beautiful table! It looks so warm and welcoming! Shirley this is a stunning table! 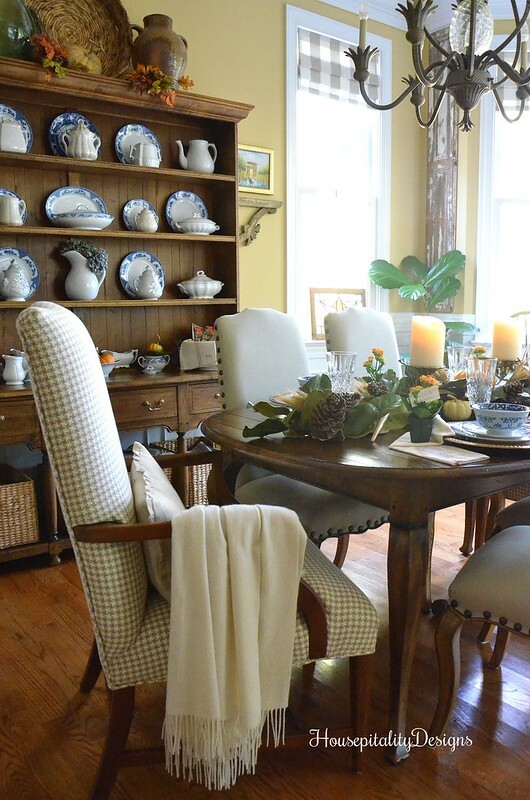 I love the blue and white, magnolia leaves and how you place the flatware! Gorgeous inspiration and I am so happy to be joining you today! Loved the vintage enamel numbers! 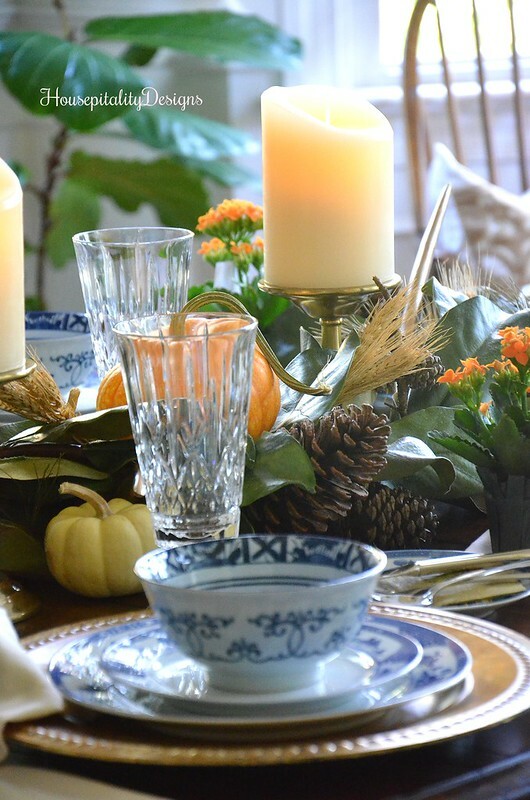 Shirley – your table is the loveliest I’ve seen…just everything from the blue and white to the pops of orange to those candles…thanks for sharing. I love all of the elements you put together. Especially the little turkey and the new blue bowls. It is a lovely table setting. Granddaughter’s pinecone turkey–too precious. I still have one from when one of my kids was small, which seems soooooo long ago. Table setting is beautiful, Shirley. I’ve been visiting the French Garden House for a few months now, and I always love her monogrammed napkins! I think they add such a warm, personal touch to your table, especially when entertaining special guests. You inspire me to want to have a pretty table this year. I usually make it simple but this year I may do it up a little more special for the family. Stunning Shirley. Shirley, you’ve set a beautiful table! I have wanted a magnolia garland for so long, and why I won’t splurge to buy it, I don’t know. I can prune branches and use them, but they only last a couple weeks. Your bowls – what a find to add to the elements! 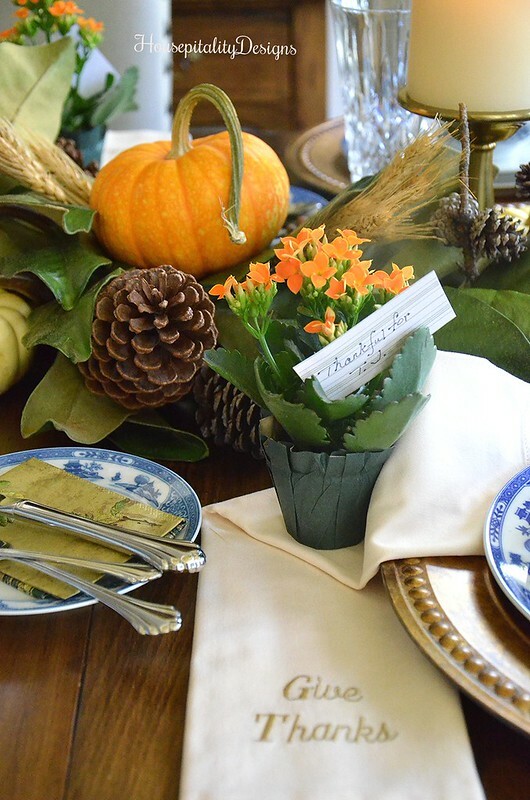 The plants, Graylyn’s little turkey, the napkins – all so very pretty. I’m just getting started on visiting this roundup of bloggers, but wanted to be sure and stop by yours. Lidy’s hostess gift is very generous, and I would love adding her napkin rings to my own collection, so that’s what I would grab from her shop. Perfect for tabelscaping! Have a great weekend. Shirley, this is such a lovely table! There’s a beautiful crispness to your choice of blue and white chinoiserie with the wonderful centerpiece garland and flowers. It’s both elegant and inviting. Enjoy your holiday!! This is so, so pretty Shirley! You have such a knack for putting a table setting together. 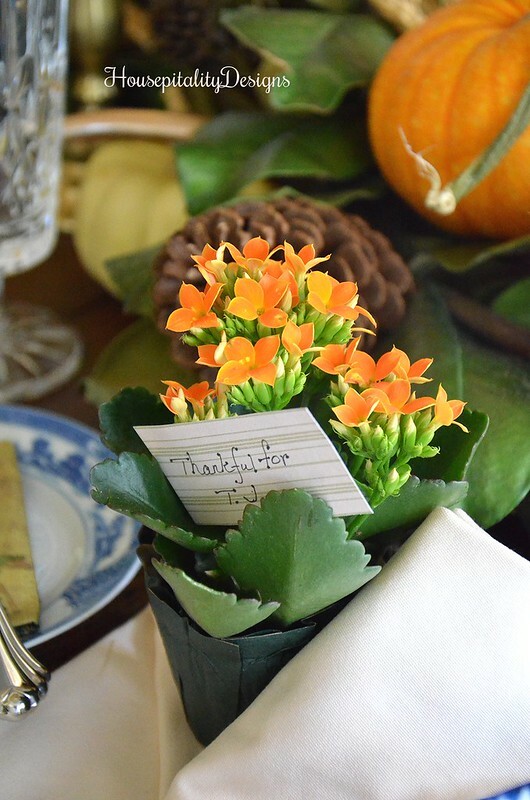 Your tablescaple for Thanksgiving is very pretty. Love the little flowering plants with each persons name on them. Great party, thanks so much for sharing. French Garden House has a lovely blue French tea cup bowl that I like. 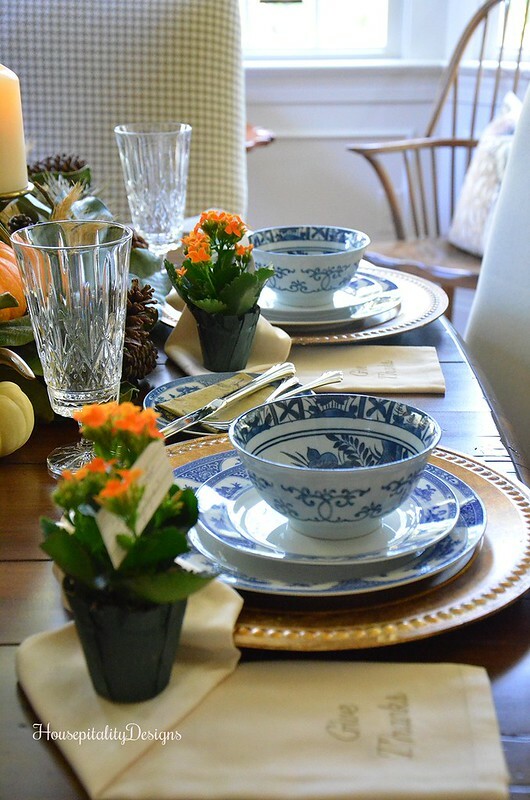 Mary’s recent post…Keep Calm and Gobble On: Thanksgiving Recipe Round-Up!